Editor’s Note: This week’s chart and article come to us from Managing Editor Rachel Gearhart and originally ran in The Oxford Insight, a newsletter exclusively for Oxford Club Members. Rachel’s research ties into an exciting new project that our analysts and editors are developing. So we’ve decided to share it with you. Keep an eye out for more details. From December 2015 to December 2016, the price of WTI crude jumped around 55%. The S&P Materials Index was up 14.08%, and the S&P Energy Index was up 23.65%. On the other end of the spectrum is healthcare and real estate. Insider buying in real estate dropped 9.26%, likely due to interest rates. And buying in healthcare decreased 17.17% due to the hiccups with Trump’s proposed Obamacare repeal. It’s no wonder the sectors performed poorly from December 2015 to December 2016. The S&P Real Estate Index was up a measly 0.01%, and the S&P Health Care Index was down 4.36%. But that doesn’t mean there aren’t opportunities in these sectors. In fact, subscribers to Alex’s Insider Alert are sitting on 16.1% and 46.5% gains on biotech companies. “Insider buying is at a three-decade low,” he wrote in a recent issue. “Most people think this is a negative thing, but it isn’t. Tracking insider buying isn’t a market-timing device. “Aggregate buying and selling by insiders tell us nothing about the outlook for the economy or the market. But individual trades provide valuable insights into the companies where they work. 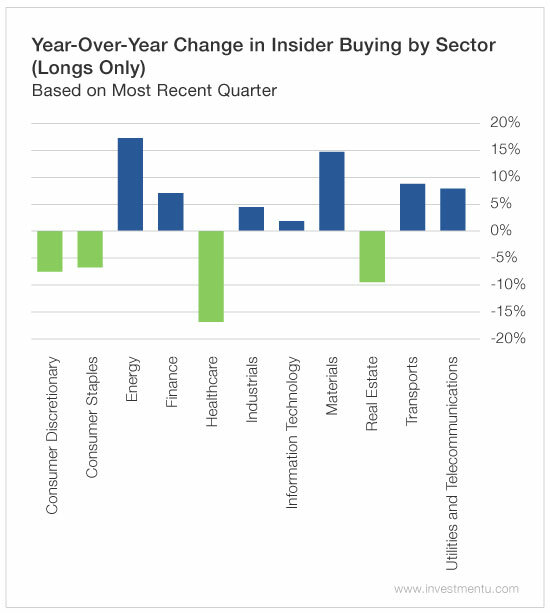 In sum, insider buying may be down, but it’s still happening. You just have to know where to look. P.S. As Alex wrote in yesterday’s issue, our research team has something even bigger in the works. They’ve been collaborating with Alex to develop something unprecedented in our industry... and we think it’s going to be wildly profitable for subscribers. Stay tuned.